Floating cranes have been around forsome time now and have proved their critics wrong.World Port Development reports on the latest developments in this challenging technology. Over the years, we have looked at the developments in the container industry and on occasion have reported on the development of floating container cranes. After all, floating cranes have proved their worth in the bulk industry. So it poses the question of why they would not be successful in the loading and unloading of containers. This particular subject matter struck a chord when World Port Development attended a seminar organized by the Technical University in Delft, the Netherlands where a student explained the many issues he encountered while writing his thesis on this interesting topic. After two years he became so disillusioned by the challenges associated with issues such as pitching and rolling of the barge or pontoon and perhaps more importantly the positioning of the spreader above the container, that he decided to concentrate on another and perhaps easier subject matter for his thesis. So, it seems that the principle of floating container cranes is desirable but perhaps unobtainable – or is it? The pontoon is equipped with 2 electrically driven rudder propellers at each end in order to achieve excellent manoeuverability and the same speed in both directions. When berthed, the Port Feeder Barge is able, without being shifted along the quay, to put or pick 84 TEU in three layers between the rails of typical quay side gantry cranes. This is more than sufficient, with a total loading capacity of 168 TEU. That is why the full outreach of the crane is not always needed. Berthing the vessel with the crane on the opposite side of the quay would speed up crane operation as the turning time of the outrigger is minimized. The height of the crane column is sufficient to serve even high quays in open tidewater ports at low tide while stacking the containers in several layers or to serve deep sea vessels directly. Although the port feeder barge looks like an excellent alternative no actual barge has yet been built to date but according to Malchow the company is on the brink of signing a licence contract with a third party. This might be a break-through if this becomes a reality as there are ‘smaller river vessels’ operating on the European inland waterways carrying containers and loading/off loading with a crane except these are not equipped with an automatic spreader but with a telescopic over height frame. 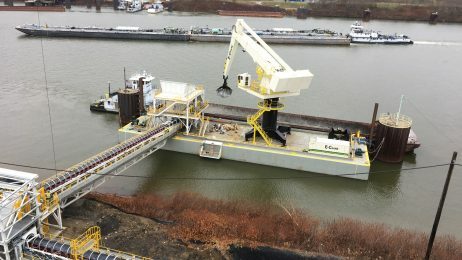 There is one interesting observation in the specification of the port feeder barge and that is that the crane will be provided by Austrian-based Liebherr. Liebherr has a separate department specializing in offshore and ship cranes and has successfully teamed up with Italian companies Logmarin and Bedeschi to provide floating terminals for the bulk industry (see last year’s article). But it doesn’t stop there for Liebherr – the applied crane technology for floating terminals continues as increases in capacity for other areas improve. More recently, Liebherr developed a heavy lift offshore crane, type CAL 64000 – 1500 Litronic, for the company Beluga Hochtief Offshore, for a special jack-up vessel for the assembly of offshore wind power stations. The crane will have a maximum lifting capacity up to 1,500 tonnes at a maximum radius of 31.5m.The boom length of the crane currently on order is 105m. Moreover, the crane is designed as ‘Crane Around the Leg’, i.e. it is built around one of the vessel’s four legs – making the new crane the first heavy lift offshore crane in the world to be built according to this design. The crane is able to rotate 360 degrees around the vessel’s leg and will be equipped with a powerful electro-hydraulic drive with 4,000 kW, the Litronic control system developed by Liebherr as well as the integrated power management provide optimum performance in all operating conditions. Although the typeCAL 64000 – 1500 Litronic crane is enormous it might pave the way for future applications of using ship cranes for floating terminals. Similar crane expertise and technology is used at Germany-manufacturer of mobile harbor cranes, Gottwald Port Technology. Over the years Gottwald has successfully sold floating cranes to operators by using their mobile harbor crane technology and installing it on a barge. Last June, the company received an order from India-based Archean Group for a G HPK 8200 B Floating Crane for its coal operations in Indonesia. With this order the total number of this crane type sold since the launch in 2004 has increased to 18. The Archean Group, a new customer for Gottwald, is a diversified industrial conglomerate with interests in salt, mines and minerals, shipping, building materials, and industrial chemicals. Through its affiliate PTCore Mineral Indonesia the group operates coal mines in Indonesia, serving customers worldwide. 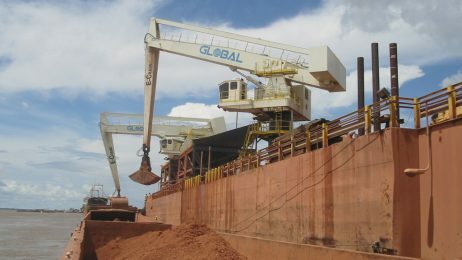 The new G HPK 8200 B, which is scheduled to be delivered in August 2010 and expected to start commercial operation before the end of the year, will be used for open-sea trans-shipment of export coal from barges to ocean-going vessels off the Indonesian coast in the province Bengkulu (also known as Southwest Sumatra). The crane is designed as a 4-rope grab crane for heavy-duty bulk handling with a grab capacity on the ropes of 63 tonnes up to a radius of34m.It can be used alongside ships of all sizes and, depending on conditions, is designed for handling rates of up to 1,500tph.Using proven Mobile Harbor Crane technology from the slew ring upwards, the crane will be mounted on a cylindrical pedestal integrated in a tailor-made barge design.Both the pedestaland the barge will be manufactured by the customer. Gottwald has recognized the Americas and large parts of Asia, as hot spots for their floating crane solutions. According to the company, Asia’s economy has been developing fast with terminal planning and extension on the increase and floating cranes are the ideal choice to improve and increase handling capacity in ports and terminals especially because of their short delivery lead times. 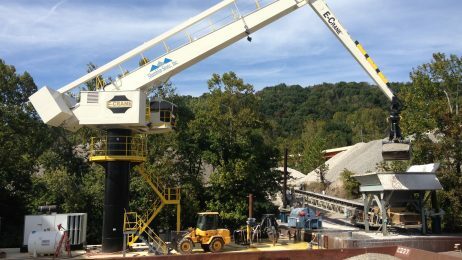 Last year, the company sold four new floating cranes – all were 4-rope machines for bulk handling operations – especially coal. The orders were received from new and existing customers in Asia and the United States. 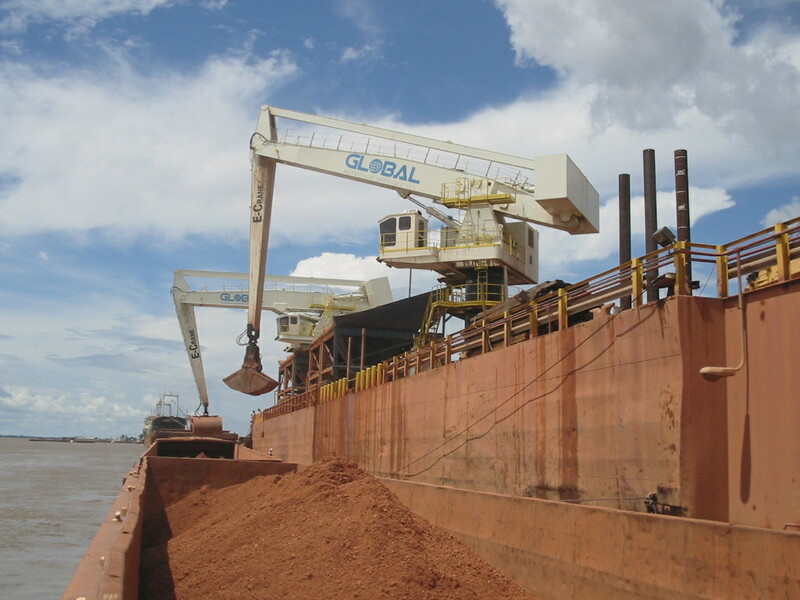 In the United States, E-crane is working hard to apply their ‘balance crane’ technology to floating terminals. Like Gottwald the company has diversified its portfolio by applying their balance cranes technology to rail-mounted, floating and crawler cranes. It has gone even further by entering the dredging industry by offering their cranes with a special dredger grab further expanding their customer base. E-Crane recently sold a new barge unloader to Power South Energy Cooperative for its upgraded Lowman Power Plant on the Tombigbee River near Leroy, Alabama for flue gas desulfurisation (FGD).The company used an old gantry rope crane to unload coal from barges for many years. 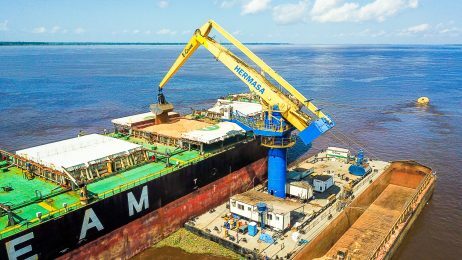 But since the new FGD process requires limestone, the company has to handle coal and limestone, creating the need for a faster, more efficient and more versatile barge unloading capacity. In addition, the Tombigbee River level at the Lowman plant fluctuates up to about 35 feet, depending on the season and weather. “This had caused us some real problems over the years,” said Mike Barton, Utility Supervisor at PowerSouth.“Crews were forever running up and down steps trying to secure the barges under difficult circumstances. It was a time and safety factor that we just had to live with.” After investigation, it was determined that there was a complete and easy solution to the increased material unloading and river level problems: an E-Crane floating terminal consisting of two barges (one for the E-Crane and one to support the conveyor),a hopper, a barge-haul system, and a barge-breasting system.